US President George Bush has mounted an impassioned defence of the invasion of Iraq and vowed to win the war on terror. During the first day of his historic state visit to London he said the US and the UK "share a mission" as defenders of freedom across the globe. And he told the audience at London's Banqueting House that the danger of terrorists using weapons of mass destruction aided by dictators represented "the greatest threat of our age". "The evil is in plain sight. The danger only increases with denial. "Great responsibilities have fallen once again to the great democracies. We will face these threats with open eyes and we will defeat them." The speech to foreign affairs experts came amid tight security for the president's visit. Who will say that Iraq was better off when Saddam Hussein was strutting and killing or that the world was safer when he held power? Later on Wednesday police made some arrests as protesters gathered in the Mall near Buckingham Palace. In his speech, Mr Bush said a global response was needed to address such threats, along with a recognition that "in some cases the measured use of force is all that protect us from a chaotic world ruled by force". Defending the war in Iraq, he said: "The dictator had been given many chances to account for his weapons programmes. Now the resolutions he defied have been enforced. "Who will say that Iraq was better off when Saddam Hussein was strutting and killing, or that the world was safer when he held power?" Mr Bush said the UK and US shared "a mission in the world beyond the balance of power or the simple pursuit of interest". "We seek the advance of freedom and the peace that freedom brings," he said. "Together, our nations are standing and sacrificing for this high goal in a distant land at this very hour." 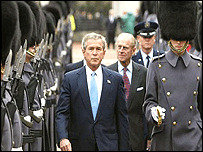 Mr Bush was earlier welcomed by the Queen at a ceremony full of pageantry at Buckingham Palace. The president's visit comes amid unprecedented security due to anti-war protests and increased terror fears. Despite the intense policing the visit began amid claims the Mirror newspaper had exposed a breach in security. The claims have prompted a Buckingham Palace investigation and Home Secretary David Blunkett has made a statement to MPs about the incident. The Mirror newspaper claimed one of its reporters got a job as a footman in the palace using fake references and was set to serve the president's staff breakfast. A Buckingham Palace spokesman has said it is not ruling out legal action against the newspaper and its reporter. In his Banqueting House speech, President Bush paid tribute to UK service personnel who died in the war in Iraq and those serving in the country. And he said the UK and the US enjoyed a "very strong" relationship based on "an alliance of values". Hailing the support he has received from Tony Blair, he went on: "The British people are the sort of partners you want when serious work needs doing. "The men and women of this kingdom are kind and steadfast and generous and brave. And America is fortunate to call this country our closest friend in the world." Mr Bush vowed that the coalition would not turn away from Iraq in the face of threats from "a band of thugs and assassins". He also reaffirmed his pledge to work towards a viable Palestinian state amid security for Israel. And he called for a "democratic revolution" in the Middle East. At Prime Minister's Questions, Tony Blair stressed the importance of Britain's relationship with the US. Conservative leader Michael Howard paid tribute to Mr Blair's close relationship with Mr Bush. The Stop the War Coalition predicts that 100,000 people will take to the streets on Thursday for the main protest against Mr Bush's visit. The formal welcome for Mr Bush and his wife Laura from the Queen and Duke of Edinburgh came after a 41-gun salute. Peace campaigners are attempting to demonstrate their opposition to Mr Bush's visit in a series of protests across the capital. Parliament Square, the South Bank and the Exxon-Mobil headquarters are among the locations earmarked for demonstrations. A "roaming" Street Party and a Resist Bush Tea Party are also planned, while London Mayor Ken Livingstone has organised a peace party in City Hall for groups opposed to the war in Iraq. Mr Bush is due to meet British families of those who died in the 11 September attacks in New York. The president is also due to meet Mr Howard, who supported the war, and the Liberal Democrat leader, Charles Kennedy, who opposed it. 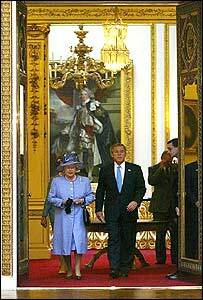 In the evening, Mr and Mrs Bush will be guests of honour at a state banquet at the Palace. "So far day one of the visit can be counted as a success"